can someone out there go an dhelp this old lady keep her home? I bet California has a law just like Illinois the authorities can come and clean her apartment for her and put her back there to live. This landlord is the worst piece of trash alive–with the court and attorneys not far behind in falling into human trash recepticles. Evelyn Heller, 100, was evicted from her Palm Desert home during a brief trial on Friday. Landlord claims Heller’s apartment is in “deplorable” condition and that she disrupts neighbors. Heller now has two weeks to move out, says she does not know where to go. Evelyn Heller, a frail-but-feisty great-grandmother with a long white ponytail, shuffled across a Palm Springs courtroom, barely lifting her feet taking tiny steps. When she reached the judge’s bench, she eased forward on to her toes, then leaned in close, as if unable to see the man in front of her. Heller, a Coachella Valley resident who was born in 1915, was evicted from her Palm Desert apartment during a brief trial at the Palm Springs courthouse on Friday morning. 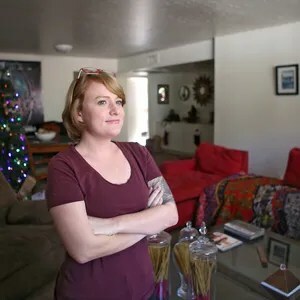 Despite reluctance voiced by both the judge and the plaintiff’s attorney, Heller was ordered out of her home, and told to pay $616 in prorated rent and more than $800 in court and attorney’s fees. She now has about two weeks to leave her apartment. Heller said she does not know where she will go. Heller’s landlord, Deep Canyon Desert LLC, which owns and manages a small cluster of beige apartments at 45200 Deep Canyon Road, said it wanted Heller evicted because she often had loud, disruptive arguments with one of her daughters. The company threatened to evict her twice before, but nothing improved, so it followed through this time. The apartment complex manager, Melody Morrison, also told a judge said Heller kept the apartment in “deplorable conditions.” A Desert Sun reporter who visited the apartment on Friday afternoon found the carpet dirty and the living room cluttered with boxes and stacks of magazines, but far from the point of hoarding. After court, Morrison declined to comment, then walked briskly away from a reporter to avoid questions. The company’s attorney, William Windham, an eviction specialist, said his client did not want to evict Heller, but felt it was a reality of their business. Windham said he felt conflicted too. In this case, that action came in the form of an “unlawful detainer,” which is a mundane court filing in which a landlord asks a judge to force a tenant from a property. Cases like these are rarely worthy of media attention, but the trial held on Friday morning was a strange one. Heller defended herself, despite the fact that she could barely see or hear. After she took an oath to tell the truth, she kept her hand raised and did a brief hula dance, then laughed under her breath. Her eyesight was too poor to read court documents until someone volunteered a pair of eye glasses from the courtroom audience. And finally, when it came time for arguments, Heller refused to stay at the defendant’s table, and instead hovered on the edge of the judge’s bench, unwilling to sit. For most defendants, this would result in a firm response from the bailiffs – including possible arrest – but as Heller pleaded with the judge, barely out of arm’s reach, deputies stood back and watched, uncertain how to react. This leniency appeared to be a sign of sympathy, but in the end it didn’t matter. Riverside County Judge Charles Haines ruled against Heller without any deliberation. He issued his judgment in a low, hushed tone that she couldn’t hear. Outside the courtroom, a deputy had to explain to her that she had lost. Reporter Brett Kelman can be reached at (760) 778 4642, brett.kelman@desertsun.com or @TDSbrettkelman on Twitter. I did call to confirm and the man that answered the phone said that this creep probably did evict a 100 year old woman from her home. Disgusting. I’ll email him this blog and demand he take care of this woman for the rest of her life. please call attorney William Windham and tell him what you think about this eviction. Think he shoud give the client the money back, vacate the order pay this nice lady’s rent for the rest of the year. What do you call 100 attorneys buried in concrete up to their necks? This entry was posted in Uncategorized and tagged corrupt landlords, corrupt melody morrison, elder abuse, financial exploitation, wrongful eviction by jmdenison. Bookmark the permalink. Illegal immigrants keep our social security afloat. They pay in but do not collect any benefits. Refugees run from destroyed countries where the US now manurfactures 80% of all war munitions in the world. This is just a 100 year old woman with an eviction attorney that has no sense of morals or responsibility. He should be ashamed of himself.